Corned beef, cabbage, and potatoes – the three things to have on your table for an American Irish St. Patrick’s Day. 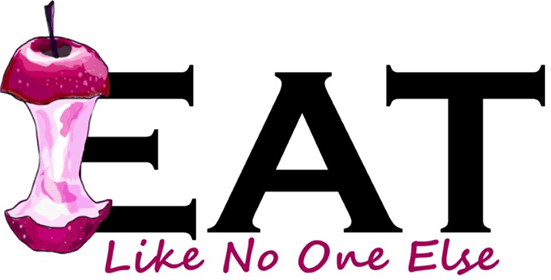 Here at Eat Like No One Else, we don’t want to just cook these three things like everyone else. Oh no sir. We want to change up the meal to be even more delicious and more gourmet like. For us it starts with dry brining and dry aging our own corn beef (learn how). 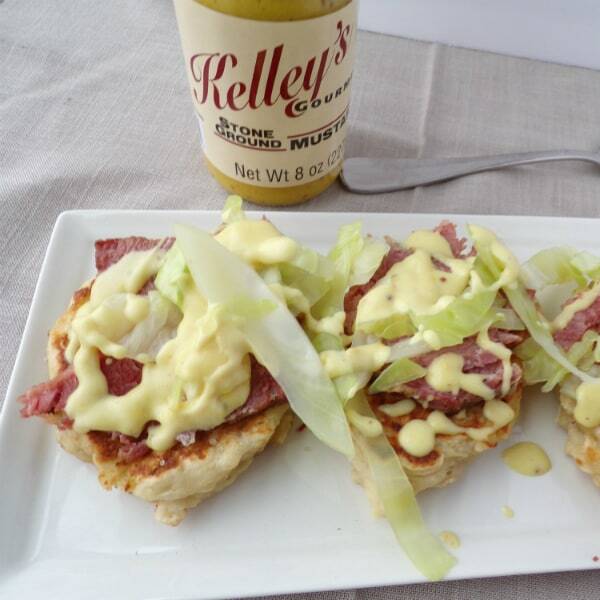 Then the corned beef is served over boxty cakes (potato pancakes) with shredded cabbage on top. 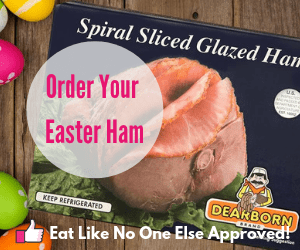 Now this would have been great on it’s own but I had a friend comment on our facebook page that she uses spicy mustard with her corned beef. That got me thinking I wanted to incorporate mustard in more than just the dry brine for beef. At the last minute, my wife and I came up with the idea to make a creamy mustard sauce to serve on top and that’s what really made this dish the best corned beef and cabbage dish I ever had. Take a close look at that mustard sauce. 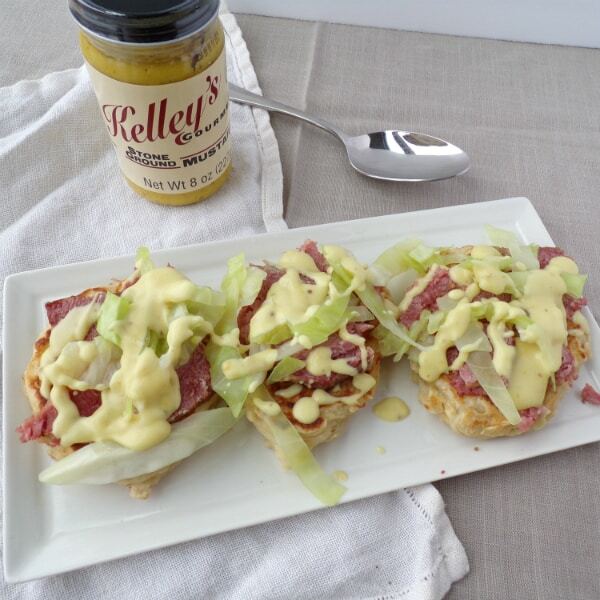 Kelley’s Gourmet Stone Ground Mustard is what I use and recommend. Below you will find a few notes and then the recipe for each component. I add enough water to cover the corned beef in my dutch oven. Toss in 1-2 carrots and 1-2 stalks of celery. Bring to a boil. Then simmer for 3 hours until the brisket was fork tender. I save some of the cooking liquid to use in the mustard sauce. The brine I used to make my corned beef made for a really flavorful liquid, so I want to use it as much as I can to impart more flavor. I have also tried cooking the corned beef in my Instant Pot. You can cut the cook time in half this way with equally good results. You could totally go ahead and try that with any pressure cooker. This sauce comes together really fast and is really tasty. I make it in a non-stick frying pan. By increasing the surface area of the sauce it allows the sauce to thicken quicker than if you did in a deeper pan. I make a roux (butter and flour) to thicken the sauce as well as some heavy cream. I cooked the Boxty cakes on my electric griddle. It gives you a wide space to work with and you can cook several at a time. The recipe calls for leftover mashed potatoes, so I just used the leftover Colcannon I already had in the fridge. The key to cooking the cabbage is to use a lot of water in a big pot along with some salt and sugar. You only need to boil it for a couple minutes, so that the cabbage is tender without mush. I never cook cabbage along with corned beef. It just ends up disgusting the way in texture, taste, and definitely smell. I think that’s why a lot of people don’t like cabbage. 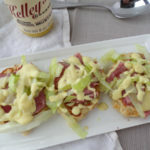 Before I share the recipe, I wanted to talk about the mustard I used in the sauce – because again this recipe is all about the sauce! I am a big fan of Kelley’s Gourmet Stone Ground Mustard. It’s a mustard that hits you with the sweet, the spice, and the heat. If you were to compare this mustard to a standard generic yellow mustard, the generic mustard is like one person signing by themselves. Kelley’s mustard is like if a group joined the solo act and they could sing in harmony. In simple terms, the flavor is more complex. I love that it has a nice punch of heat at the end, which marries perfectly in this dish with the cream in the mustard sauce. 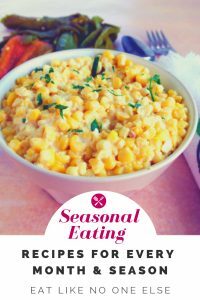 I go nuts over dishes that have that are hot and creamy (like my Hatch Chile Creamed Corn). In case you were wondering these aren’t as good as they look. THEY ARE BETTER!!!! The mustard sauce is the key that brings all the deliciousness together. Place corn beef in a dutch oven or large pot. Fill with enough water to just cover. Break the carrots and celery into large chunks and add to the pot. Bring to a boil. Reduce heat to simmer. 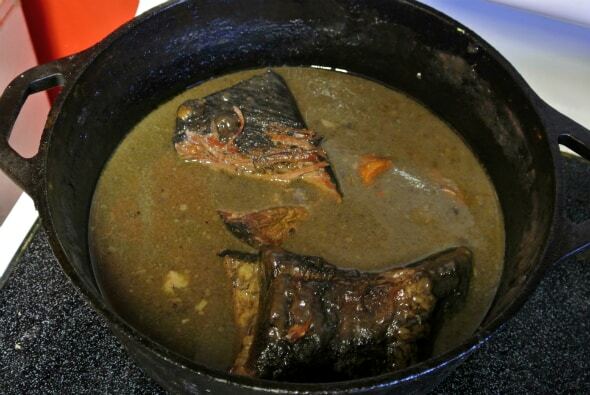 Cover and cook for at least 3 hours or until the meat is fork tender. Combine the mashed and raw potatoes in a mixing bowl. Mix well to combine. In a second bowl combine the flour, baking powder, baking soda, and salt. Add the flour mixture to the potatoes and mix to combine. Stir in the buttermilk. Add additional milk 1 tablespoon at a time if batter seems too thick. Keep in mind this batter should be thicker than most pancake batters. Heat your griddle up to it's highest temperature. Using a ladle to drop the batter onto the griddle. Cook for about 4 minutes per side until brown. You can place them in a oven set to it's lowest temperature to keep them warm. Bring a large pot of water to a boil. Add the salt and sugar. Cook for 2-3 minutes until the cabbage is tender. Melt the butter in a frying pan over medium-high heat. Once it has fully melted add the flour. Stir with a wooden spoon to combine and cook for about 1 minute. Add the milk, mustard, and cooking liquid. When it comes time for serving. 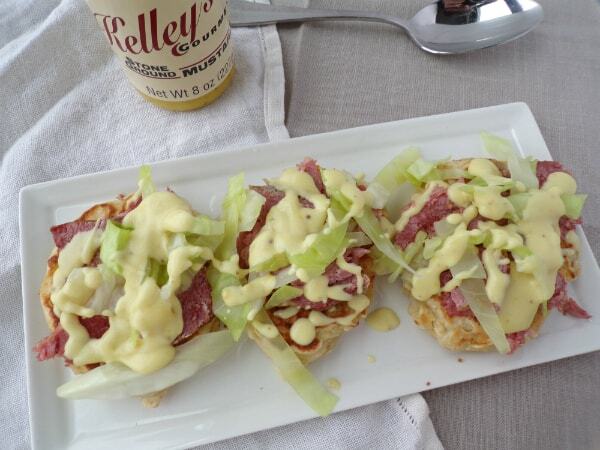 I place 1 boxty cake on a plate, then add the corned beef and drizzle on the mustard sauce. Serve the cabbage on the side or you can place it right on top just as you would a last minute herb. 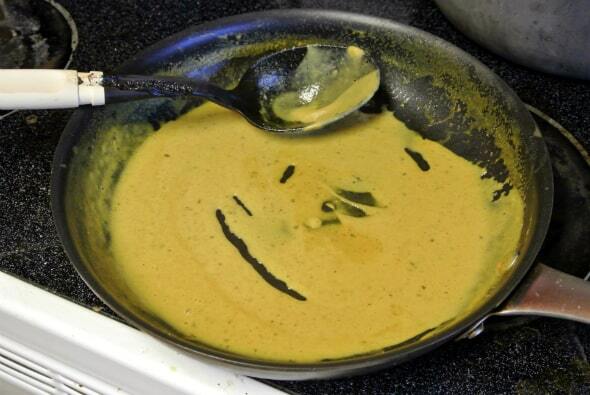 This mustard sauce is absolutely AMAZING!!!! Hi Julie. Thank you so much for taking the time to share that with me. I appreciate it and am so glad you loved it. Made your recipe tonight with a corned venison roast. Will definitely be making this again . Thanks so much for posting this recipe. Oh thank you so much. I am so glad you liked it and thankful that you came back to leave a comment.